Would anyone know where you buy the platform or if it's custom, anywhere that I can get instructions on how to make it? I've been searching around online but no luck yet. Any help would be appreciated. Im mocing one for a window display so will let you know how it goes. Ive just google pictures and then sketched a desgin and worked out peices. Pretty cool platform. I'm assuming the official UCS Shuttle would fit on it (despite the auction mentioning a custom shuttle)? "The main top platform is HUGE, it is built to be extremely sturdy, and easily supports over 5 kg, so you can land 4 Imperial Shuttles on this baby if you want, and more!" So even if it is a custom and slightly smaller Imperial Shuttle, the UCS should fit perfectly and actually look like it "belongs" and not be awkwardly larger than the stand. Thanks! Boy this is a very tempting Bricklink project. ^I was thinking the same thing.. I'm sure it is just like in the film - but how do you get down to the gantry below from the landing pad? In a film where its seen for about 5 seconds it doesn't matter, but if that was in my house it would really bug me. I suppose the $10 cost of those instructions isn't that high, but from the images, the model isn't too sophisticated. I realize that not everyone is adept at designing models, but I think the subject is simple enough that most people would be able to do a nice rendition and, IMO, it would be considerably more rewarding. ^ That may be true, but it is a ~1750 part creation and even taking out the technic pins and 1x1 studs its over ~1300. For a simple platform it is a relatively large part count. I bought the instructions and am interested to see how it turns out. Anyone know if it is to scale with AT-AT? From the instructions it looks like those bridges that would be at AT-AT loading height are 19 bricks tall or a bit over 7 inches. Guessing that is smaller than AT-AT scale. Don't have one so not sure. I am looking for the custom lego endor landing platform below. I bought the endor landing along with the complete endor villages on ebay but have not start the project yet...need room. Does anyone know if the custom lego endor landing platform instruction below or any other custom lego modular available for sale beside ebay? ^^Its gonna be only on ebay as i doubt those things can be produced in large quntaties and brickset only deals in sets only. Thanks for all the help/ info... Does anyone know about how much it costs by the time u buy all the bricks for this... I'm lookin for an approximate estimate of how much I'm looking at. Also, bricks for the platform... Where's a good place to start when looking to buy... Where would u recommend I guess I'm saying. 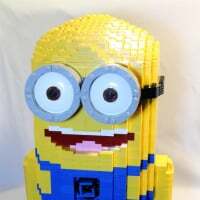 Lego.com there pick a brick section is really good and will have a lot of what you want like semi circles and quaters as well as base peices. prices range from 0.05 to 0.16p or cents. it can be anything and without seeing peice count its a guess but say a couple of hundred. thats what its costing me to moc one. Im going for 8x16 base peices held in place by a network of 1x8 light grey bricks. i purchased the instructions for it about a year or so ago (actually was getting it for one of the trees - the platform was part of the deal). i already had a lot of the gray parts for the platform but if i had to guess, it probably ran about $75-100 (mainly for the cylinder panels). the folks that sell it ask that you don't give away / resell the instructions, so keeping in that vein, i will say that built as-is the piece count is 1756 for the platform landing (not sure if posting the piece counts fall under that gentleman's agreement or not). there are some corners that can be cut (the instructions make it a rather solid build) so that number can go down fairly easy. Is there any other place than eBay to buy the instructions? I'd like to buy them just I've been screwed over by eBay and don't currently have an account. Also REDBULL the pick a brick was really helpful. RENNY: I did find out about the scale for AT-AT: if your going off the instructions from eBay: This was designed for an AT-AT walker that is exactly 6 studs less in height than the official AT-AT Walker, therefore you simply add 1 more 4x4x6 cylinders around the pylons to make it exactly 6 studs higher if you want to match the same scale. @brickmaster69, that's awesome, thanks for the info! @brickmaster69 - you could contact them via their etsy store - http://www.etsy.com/shop/Fullybrickmodels - and explain that you don't have an ebay account.